This small town is located 11 miles (18 km) north of Hawick and 19 miles (30 km) west of Kelso on the Ettrick Water. It was the county town of the old county of Selkirkshire. Selkirk was a mediaeval town when Prince David (later King David I) erected an abbey in 1113, though the monks shifted to Kelso in 1128; a castle and hunting forest were established in the same century. The town became a royal burgh in the 13th Century and the Scottish Parliament met here in 1204. The people of Selkirk are known as Souters (shoemakers) acknowledging the town's former main industry. The reduction in influence of the town guilds in the 1830s, and better communications, brought the rise of Selkirk as a centre for the manufacture of tweed and woollens. The town was once the terminus of the Selkirk and Galashiels Branch Railway, which opened in 1856. The passenger service ended in 1951 and the line closed completely in 1964. From the 1970s the textile industry began a sharp decline and light industries such as micro-electronics have become a mainstay. Selkirk's most conspicuous buildings are its mills, now all put to other uses. With the exception of Philiphaugh Mill (1856) on Ettrickhaugh Road to the southwest, these occupy a strip of land between Dunsdale Road and the Ettrick Water to the north of the town centre. 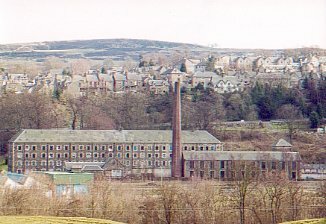 These comprise Ettrick Mill (1836), Dunsdale Mill (1837), Forest Mill (1838), Bridgehaugh Mill (1865), Heather Mills (1868), Yarrow Mill (1868, demolished 1998), Whinfield Mill (1875), Tweed Mills (1883), Linglie Mill (1894) and St. Mary's Mill (1894). Other notable buildings include The Haining (1794), a classical house on which grounds are the ruins of Selkirk Castle (on Peel Hill); Halliwell's House Museum which is Selkirk's oldest domestic property (c.1800, but with older fragments); the Sheriff Court (1870); and Town House and Old Court House (1804; now Sir Walter Scott's Courtroom). Sir Walter Scott served as Sheriff here (1803 - 1832) and some items of his are on display at the Old Court House. The Duke of Buccleuch maintains a residence at nearby Bowhill, dating from 1708, while explorer Mungo Park was born at Foulshiels in 1771. There are statues to Scott and Park. Robert Burns wrote his Epistle to Willie Creech in Selkirk in 1787. William Wallace was said to have been declared Guardian of Scotland at the old Kirk of the Forest here in 1298. A statue by Thomas Clapperton (1913) commemorates Selkirk's sole survivor at the Battle of Flodden (1513), after which the English destroyed the town. In 1645 the Covenanters under David Leslie carried out a massacre of Royalists under the Marquis of Montrose's command. Selkirk's Common Riding takes place in the middle of June and is the second largest in the Borders. This ensures the burgh lands are protected and is led by the Royal Burgh Standard Bearer, who represents the Flodden survivor. Protecting the common land is taken very seriously; Selkirk's first provost, John Muthag, and his bailie, James Keyne, were murdered for defending them in 1541. The Selkirk Bannock is a traditional type of fruit scone first recorded being made by a local baker in 1858 and enjoyed by Queen Victoria when she visited nearby Abbotsford House in 1867.